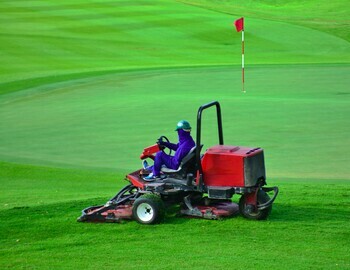 Keeping a golf course maintained and beautiful is a HUGE responsibility that lies in the talented hands of our superintendents and agronomic team. Our staff is always at work hours before the first tee time of the day through rain, snow, heat, and every other insane weather condition you can imagine. Their hard work and dedication plays an integral role in ensuring each guest enjoys a fun and outstanding golf experience. Here are some tips from the PGA that you can do as a guest to help our agronomic team keep the course in excellent condition. You can use the toe of your shoe to kick in the turf around the edges of the divot. Many courses often put containers of a soil/seed mixture on their carts and tees. If this is the case, simply fill in the divot with the mixture. Bring a rake into the bunker with you -- remembering that you should always enter the bunker from the low side at a point nearest to the ball. Whenever possible, avoid walking on the steep face of a bunker. After hitting your shot, rake the area you played from, as well as all your footprints and any others within reach. Rakes should be left either in or nearby the bunker. Important to repair any pitch marks or indentations caused by the ball hitting the green. Using a tee, knife, key or repair tool, repair the mark by working the edges towards the center, without lifting the center of the mark. Don't tear the grass. Finish by smoothing the area with a club or your foot. Try to get the area smooth enough to putt over. Just remember that while the Rules of Golf allow you to repair pitch marks on your putting line, you cannot repair spike marks on your putting line until after you have putted.